Can I Use Silicone Brushes For Padding Glue Since They Are Easy To Clean? We had a customer bring up this great question: Can I use silicone brush for making notepads since it is so easy to clean? Here’s what we have been able to come up with in researching this. The silicone brushes are not really used for applying the glue, rather they are used to spread out a bead of glue that is applied with a squeeze bottle into a uniform width – like wood glue. In fact, they are sometimes called glue spreaders. The brush’s thicker silicone strands will fan out what is already applied and are really not used to soak up the glue for application. Padding glue needs to be applied with a hair/fiber brush. Our 2 inch wide pad brush is made using a natural hair/fiber that is well suited for soaking up plenty of the thick padding compound. That compound stays in the brush and is then applied to the stack of sheets that you want to adhere together. Cleaning a padding brush is pretty easy. Just soak it in water after you you you are done applying the padding glue. Once you are ready for cleanup, lightly work lukewarm water between the bristles to remove any leftover padding compound. Continue this until the water from the brush rinses completely clear. The entire cleaning process should take less than 3-5 minutes. Then set the brush out to dry. Do you have any tips or tricks for making your padding easier? Please feel free to share in the comments below. The honest answer is that removing old padding compound buildup is an awful lot of scraping, I mean A LOT! Using a heat gun will help to slightly soften the mess, but you must take care to not heat your press up too much as to bubble up the paint finish or cause damage. We have actually tested a huge host of chemicals including blanket wash, adhesive removers (like Goo-Gone) and various solvents – none of these help at all. To be honest, if it has collected and built up over years, it’s likely you may not get it all off. The ideal solution is to not allow it to build up to that level. Ultimately, it starts with the application – neatly applying the proper amount of compound should reduce wasted slop over spillage and it cuts down on the glue dripping down onto the press. Additionally, folding a paper channel to catch any dripping glue under your stack of sheets will keep your press clean (see the video link below & go to 3 minutes, 48 seconds into the clip). We highly recommend using a plastic putty knife immediately after unloading your padded job to remove any padding compound left behind. 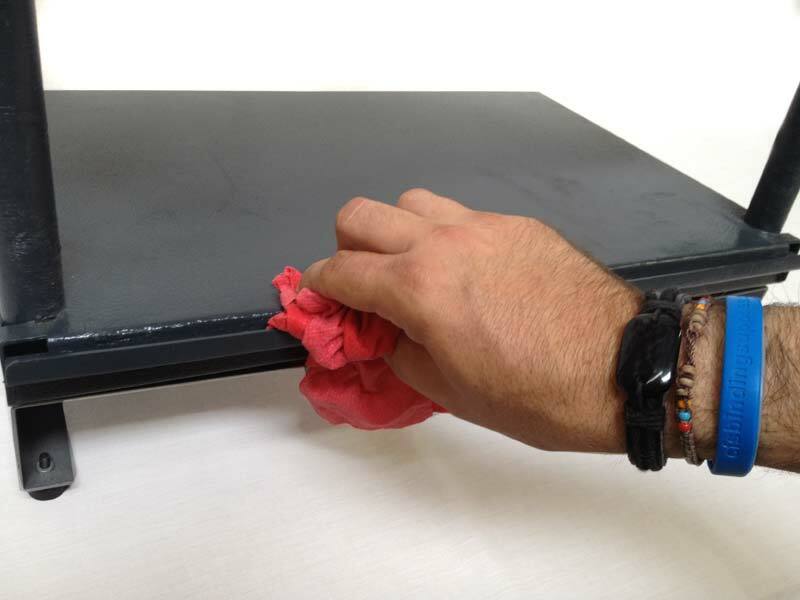 Then use a damp cloth to scrub away any residue while it is still somewhat water-soluble before fully curing. This will keep your padding press looking good as new. Do you have any tips or tricks that you use when padding? Please share in the comments below. 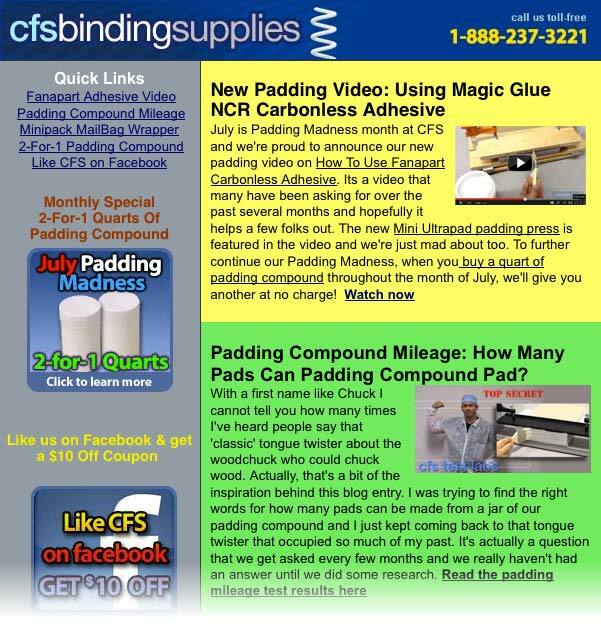 That’s right, July is Padding Madness Month at CFS and our newsletter is padded to the gills with lots of informative goodies. We’ve announced our newest video on How To Use NCR/Carbonless Padding Glue that features the Mini Ultrapad padding press. We also share the details on a common question regarding the total coverage area for our padding compound. The Padding Madness continues with our July Special: buy 1 quart of padding compound and get a free quart! Not to make it all about padding: we’ve introduced the new MiniPack Mailbag plastic document wrapper. To view the full newsletter just click the image below. How Much Pads Can A Quart Of Pad Compund Pad If Pad Compound Does Pad Pads? With a first name like Chuck I cannot tell you how many times I’ve heard people say that ‘classic’ tongue twister about the woodchuck who could chuck wood. Actually, that’s a bit of the inspiration behind this week’s blog entry. I was trying to find the right words for how many pads can be made from a jar of our padding compound. It’s actually a question that we get asked every few months and we really haven’t had an answer until we did some research. The industry experts at the CFS Test Labs have put this question into play and have given us the following results. One ounce of padding compound is sufficient to cover about 60 square inches. Now while that may sound like quite a large area, think of it this way – that’s an area 8.5 inches wide by 7 inches high. So, a quart of padding compound will cover 1920 square inches – or a stack of 8.5″ wide sheets that’s nearly 19 feet tall. That’s a big bunch of note pads! Put that way, you’re sure to get plenty of mileage from your quart of padding compound. And remember, a 2nd coating is really just putting glue on top of glue, it does not add any further adhesion. Do you have any facts that you’d like the CFS Test Labs to evaluate? Let us know in the comments below. 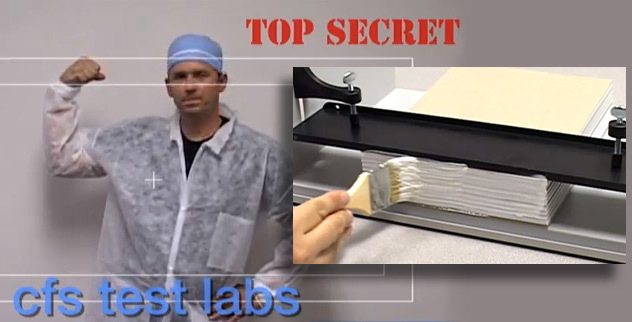 By the way, if you want to see more of the highly scientific methods and results from the CFS Test Labs, check out the videos below containing some of their top secret footage. This is a product that I am very excited to see come in our doors. In fact, we’ve had more than a boatload of calls over the years from customers asking if we can get this item. It’s the Quick As A Wink Padding Counter that makes creating notepads super fast and easy. 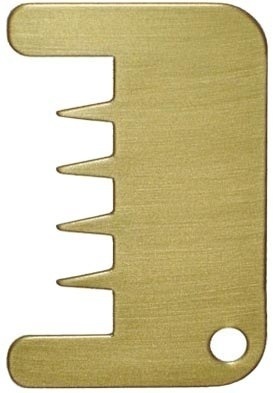 Here’s how this padding comb separator works. Essentially, you take a ream’s worth of paper (assuming 20# bond, standard copier weight) and stab it into the side of the stack near a corner edge. The teeth of the comb are set to quickly divide the sheets into 5 stacks of 100. “How quickly?” you ask. Well, you guessed it, as ‘quick as a wink!’ From here you can slide chipboard into the gaps created by the pad counter and you have 5 stacks of about 100 sheets. Do you have any quick tips that you use to speed up your padding or other bindery operations? Please share in the comments below.